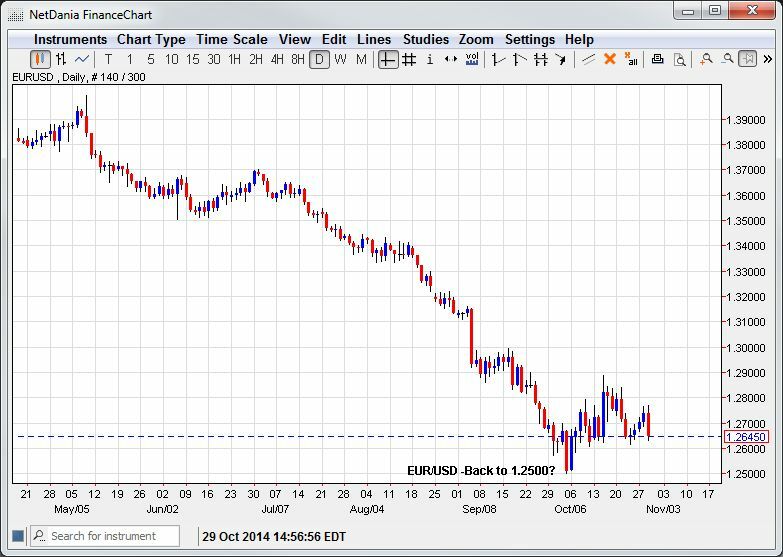 EUR/USD – Back to 1.2500? Well the Fed finally ended QE and the dollar took off sending EUR/USD lower by more than 100 points in New York trade. Contrary to most conventional wisdom the Fed sent a relatively hawkish message to the market emphasizing the improvement in labor conditions and dismissing any concerns about deflation. The markets which had been primed for a much more cautious stance immediately repriced the chances of a Fed funds rate hike from the end of 2015 back to Q2 of 2015. However, the Fed left itself plenty of wiggle room and still remains highly data dependent. That’s why tomorrow’s US GDP data could be key. If the number beats the forecast it will confirm the Fed’s upbeat view and rates will likely rise further which will push EUR/USD towards a retest of the 1.2500 figure as markets once again resume trading on policy differentials. The EUR/USD remains in a long secular downtrend and the latest rally was simply corrective in nature running out of steam at the 1.2800 level. The test to the downside will target the yearly low at 1.2500 and break there would open a run towards 1.2250. Meanwhile only a close above 1.2800 relieves the bearish bias.